May 3rd, 4th and 5th, 2012 at 8pm. LIMITED SPACES!! 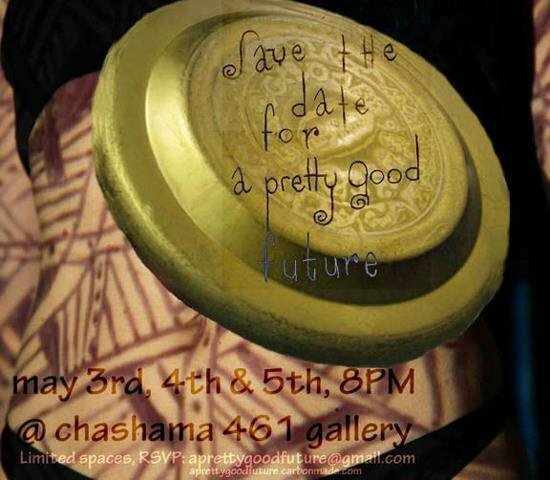 Reserve emailing aprettygoodfuture@gmail.com with date and number of tickets ASAP! Natalia de Campos is a performer, director and writer working in experimental theater and performance art. She worked in São Paulo for 10 years before moving to New York in 1998. She then worked with Richard Foreman, The Builders Association, The Living Theatre, White Oak and many others. In 1999, she founded Syncretic Pleasures to produce authored multimedia performances with a roster of international collaborators, and solo works, shown in venues throughout downtown NYC such as HERE, Ontological Theatre, Connelly Theatre, Bowery Poetry Club, SCOPE Art, Essex Street Market and others. Bryon Carr has trained, taught and performed throughout the U.S. and Europe. In New York City he has worked with White Wave Rising, Popo and GoGo Boys, Young Soon Kim, The Graham Ensemble, Chen and Dancers and The Erick Hawkins Dance Company. In 2002 he began showing mixed-media work throughout New York City in venues such as; Dance New Amsterdam, Dixon Place, Joyce SoHo and the Wave Rising Series in DUMBO to name a few. Outside of New York, he has shown in Seattle, Boston and Berlin, Germany. Thiago Szmrecsanyi is an artist, educator and exhibition designer. He works in his studio in New York. He has shown at Paco da Artes, Charas El Bohio, and many others, and curated INSERT, at he Essex Street Market with support from Artists’ Space. As a teaching artist he worked at the Bronx Museum, and for Studio in a School from 2004-2008 in all NY boroughs. As a designer and art handler he’s worked at El Museo del Barrio, Longwood Gallery/ Hostos Community College, Bronx Council on the Arts, Wave Hill, and multiple galleries and art fairs including the Armory Show and ADAA’s show. Thiago also designs sets, and has designed at TRIBECA performing arts, Connelly Theatre, CSV Flamboyan Theater, among others.